In this photo, the aircraft takes off following the ceremony. 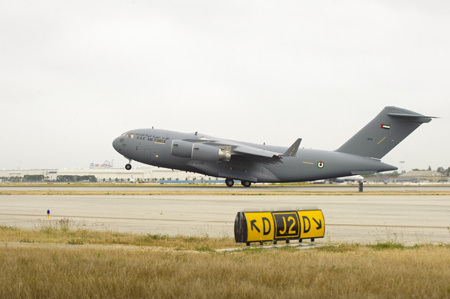 LONG BEACH, Calif., June 10, 2011 -- Boeing [NYSE: BA] delivered a second C-17 Globemaster III airlifter to the United Arab Emirates (UAE) Air Force and Air Defence today at the C-17 program's final assembly facility in Long Beach. The company is contracted to deliver a total of six C-17s to its UAE customer -- four this year and two in 2012. "Congratulations to the UAE Air Force and Air Defence on accepting delivery of their second C-17," said Bob Ciesla, Boeing C-17 program manager. "The leadership of the UAE team has resulted in incredible progress on this program. We look forward to continuing to work closely together as we deliver the remainder of the fleet." The C-17 is the only aircraft capable of performing all of the UAE's airlift requirements -- strategic and tactical, military and humanitarian, brigade airdrop and aeromedical evacuation -- using either standard runways or short, austere airfields. It can transport large payloads across vast ranges without refueling and operate in extremely hot and cold climates. With a full payload of 170,000 pounds, a C-17 can fly 2,400 nautical miles and land in 3,000 feet or less. "We're proud to say that UAE 02 is mission-ready," said Rich Cutting, Boeing UAE C-17 program manager. "UAE 01, delivered just one month ago, has already logged several missions. And that's what the C-17 is all about -- being ready to perform any mission, anywhere, on a moment's notice." As a member of the worldwide C-17 "virtual fleet," the UAE's C-17s will be supported through Boeing's C-17 Globemaster III Sustainment Partnership, a proven multinational Performance-Based Logistics program. Through the virtual fleet concept, C-17 customers receive comprehensive worldwide logistics support (spares, support equipment, tech orders, sustaining engineering, and on-site field teams) through use of shared resources across the entire fleet. This highly successful program ensures high levels of mission readiness by providing all C-17 customers -- regardless of fleet size -- cost-effective access to an extensive support program. There are currently 232 C-17s in service worldwide -- 22 with international customers. The U.S. Air Force, including active Guard and Reserve units, has 210. Other international customers include the Qatar Emiri Air Force, the UK Royal Air Force, the Canadian Forces, the Royal Australian Air Force, and the 12-member Strategic Airlift Capability initiative of NATO and Partnership for Peace nations.